Two successful marine-based charities have announced their intention to work together on a national level to benefit young people. Sea Cadets and youth charity UKSA will provide a wide range of opportunities within the maritime sector by utilising each other’s resources, facilities and expertise. The joint aim is to help young people with the transition from education into employment, offering careers in yachting and watersports as an alternative to the traditional merchant route. Maritime training provider UKSA is based on the Isle of Wight but has started to run its successful youth development programmes nationwide in partnership with local councils, helping young people aged 16 to 24. 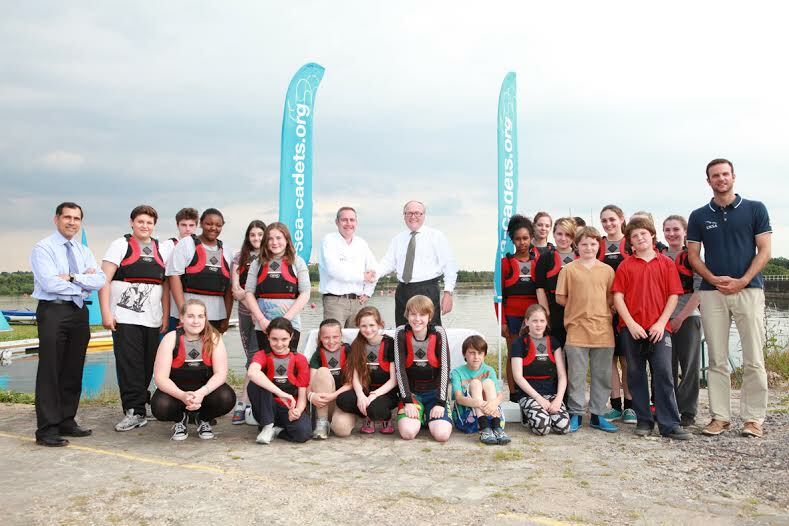 The new partnership with Sea Cadets will help UKSA broaden its engagement by using Sea Cadets facilities across the UK. Among the professional training courses offered at UKSA is a six-week programme to develop deckhands for deployment in the superyacht industry, and the two partners will now work together to identify funding for deckhands wanting to upskill to officer level via the UKSA Superyacht Cadetship. Selected Sea Cadets will be encouraged to follow this pathway and benefit from existing and newly created funding opportunities. As part of its national training programme, Sea Cadets will promote to sea cadets UKSA’s week-long Opportunities Afloat careers taster course, which explains the opportunities in yachting and watersports. The Watersports Instructor Training course will also be mooted as a good pathway into the watersports industry and a potential longer term pathway into the broader maritime sector. UKSA also offers fully funded BTEC courses, with a watersports element leading to dinghy and kayak qualifications. As they provide the opportunity for students to study at no personal cost, they could be a good route for sea cadets. Additionally, in an exciting development, the organisations will work together to offer watersports activities at the Royal Victoria Docks in London. UKSA’s Chief Executive Richard Thornton said: “Working together like this is a fantastic opportunity for both organisations and will be of huge benefit to all the young people we can reach. “We hear so much these days about a lack of opportunities for young people but the maritime industry is often overlooked. There are thousands of Sea Cadets in the UK who have joined Sea Cadets through an interest in the water, so they are the ideal young people to consider working in a sector they will have an affinity for. Captain Sea Cadets, Captain Jonathan Holloway RN, says: “Sea Cadets already know about careers in the Royal Navy and Merchant Navy but this important partnership invites cadets to think about a career in the luxury superyacht industry. Several Sea Cadets have set sail for a career after training at UKSA. James Johnson of Brentwood achieved a prestigious maritime qualification enabling him to work aboard the world’s most luxurious superyachts. He completed the three-year Superyacht Cadetship including MCA Officer of the Watch 3000GT Certificate. It meant he could work as Officer of the Watch aboard the world’s superyacht fleet, up to 3,000 gross tonnes, but also skipper smaller private yachts as they sail across the world. During his Cadetship at UKSA, in addition to intensive training at its campus in Cowes, James sailed in the Caribbean and through the Mediterranean to gain vital practical experience of working at sea. Sea Cadets also got Oliver Whitten dreaming about a yachting career, and after researching thoroughly he decided UKSA was the place to make his dream come true. The 18-year-old from Dunstable was awarded a Trinity House bursary such was his passion and determination to do the course. Oliver said: “I have a sense of adventure and want to be working on something I love doing. I started sailing on lakes and then got into racing, and I sailed and sailed pretty much every weekend to get a load of experience. Photo shows UKSA and MSSC representatives from left: Mark Windsor, MSSC Director of Lifelong Learning, UKSA Chief Executive Richard Thornton, MSSC Chief Executive Martin Coles, and UKSA Director of Operations Ben Willows. Pictured with Sea Cadets at Welsh Harp Boat Station in Wembley, North London.